Hi, my name is Anne and I’m a recovering edu-holic. I’m addicted to reading, learning, courses, credentials, anything with a syllabus, merit badge, gold star or that might result in a new strange combination of letters at the end of my name. If I’m not doing these things, I am researching these things for….for I don’t know why. It’s been over 5 years since my last credential. At the end of 2013 I got twitchy about that. I’d participated in webinars, courses and conferences but it didn’t feel enough. I was about to spend a lot of money to take a test and get a credential just because I could and felt I should. Not because I deeply wanted to. At best that’s nonsense. At worst it’s crazypants. I took a deep breath and walked away. I declared (to myself) a moratorium on professional development without a personal connection for 2014. I decided to learn, read, and study purely for the joy of it- not for approval, credentials, recognition or because something would make sense on my LinkedIn profile. A few weeks ago I signed up for my first MOOC (Massively Open Online Course)- The Science of Happiness through the Greater Good Science Center. We’re studying happiness, connection, compassion, kindness, forgiveness, reconciliation, mindfulness, and gratitude from an interdisciplinary perspective. The course draws on neuroscience, evolution, physiology, complexity, anthropology and psychology and sprinklescphilosophy, religion and humanities throughout. More relates to evaluation and the conference our program is having on Collective Behavior than I anticipated or intended. Oops! These things happen. Each week we’re invited to try evidenced-based practices to increase our happiness. Putting research into practice? Yes, PLEASE! 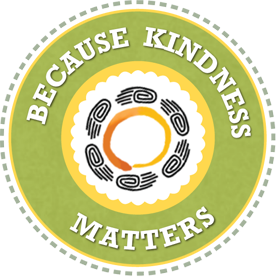 Through the course I found out that KindSpring was starting a 21-day kindness challenge on October 2nd. I signed up for that too. Why not? It’s a way to strengthen kindness muscles and find new ways to be kind with a group of people. For Day 1 the kindness challenge was “Pay forward a surprise treat”. We left a home-made banana muffin and note for our postal carrier. It doesn’t matter what course is. It could have been sewing, or watercolor painting, or a foreign language, or astronomy or ancient Greek literature or swimming lessons. The point is that we ought to give ourselves a break from achievement and learn for fun more often. Yes, I’m still eying the John’s Hopkins data science specialization through Coursera so I might finally learn R. But not this year. Right now I’m selfishly studying happiness to make the world a better place. It’s fun. It might make a difference. What are you doing to help your clients learn? One of the reasons I started this blog is because I am always finding neat evaluation-related content online that I can’t incorporate easily into my work. I don’t have other evaluators around to discuss things with and I care too much for my colleagues to ask them to pretend to be excited about my online evaluation discoveries. Recently, I found this post on the Education Week Leadership 360 blog by Jill Berkowitz and Ann Myers with the catchy headline, “Are we Learning from Evaluators?”. K-12 evaluation is not my area of expertise so I am going to pull out a few of their ideas, turn them into my own questions and try to make connections to general evaluation practice. Berkowitz and Myers remind us that research shows focusing on what we do well is a more effective way to create improvement than emphasizing shortcomings. How could evaluators use new science showing that criticizing someone makes it harder for them to change? Try taking a page from Appreciative Inquiry (AI). Hallie Preskill and Tessie Tzavaras Catsambas have a great book to help evaluators get started. After taking a few workshops with Hallie, I added one AI item to a survey, asking respondents to reflect on an experience that was “especially engaging, exciting, or meaningful. Where did this happen? Who was there? What did you do that made the interaction so successful? What about this experience made it special?” Not everyone provides great detail, but the descriptions help me and the program understand what is happening when people are having a positive experience. These responses are stories that resonate with leaders. Thanks to quantitative data, I can also explore who is not having these experiences and look for patterns. You can also structure evaluation reports in a way that uses what works to inform what is less successful. There is usually some strength or capacity that can be drawn upon to create improvement. Why are schools not “Learning Organizations”? My quick easy answer to this is, “more schools are not learning organizations because being a learning organization is really hard”. Truly answering the question would make an excellent doctoral dissertation if it hasn’t already been done. If you know of a dissertation on this, I’d love to know! One of the five disciplines is personal mastery, described as “the discipline of continually clarifying and deepening our personal vision, of focusing our energies, of developing patience, and of seeing reality objectively”. Sounds like a good practice for kids and adults to explore together in school. Definitely a good practice for evaluators. To my reading, one of the calls The Fifth Discipline asks us to answer is how to integrate multiple ways of knowing in how we operate in the world. Personal mastery is as much a way of being as it is an attitude. Mixed Methods Evaluation, anyone? How about Reflective Practice? Lived experience matters, so does what the data say. I think that holds whether you’re in a K-12 setting or treating cancer. Rather than play the game of knowledge supremacy perhaps we would be better served by a “both, and” approach. “How can we use discomfort among evaluators and those being evaluated to make us more skilled in how we give and receive feedback? There are lots of instances where evaluators extol the virtues of our profession, and rightly so. We could also choose to embrace the discomfort evaluation can cause and use that to connect with stakeholders. Let’s be honest, evaluators, we feel just as much anxiety about receiving feedback as anyone else. We could tap into our own discomfort and use that experience to create a shared connection with our clients. I’m not saying you should reveal deep, dark, personal wounds while being the bearer of bad news. However, I do think compassion and openness are in order. We should prepare ourselves to give feedback. Keep this checklist in mind the next time you need to give feedback and see what happens. I may do a post about it. It goes back to the idea of integrating ways of knowing and being in the world. We can be logical, systematic, and rigorous evaluators while also being gentle, open, and sensitive. I see no conflict there. Actually, Barbara Fredrickson has a word for the ability to, “see holistically and integrate seemingly contradictory perspectives”. She calls it WISDOM! You asked a darn good question, ladies! So, evaluators, what are you doing to help clients learn?